What sort of shape is your game in at the moment? Very good, actually. I started working on something new at the start of the year and it’s really starting to bed in now. I certainly feel that my long game is improving a lot and I’m getting a lot more consistent. I was in contention in both Tshwane [South Africa]and Morocco but couldn’t finish it off, but even in China my game was still in great shape – I just didn’t hole many putts. All in all, I’m looking forward to getting into the meat of the season and starting to put some good performances together. Have you got any specific goals this season? I have no real short-term goals to really measure myself against – just to get in contention a bit more and ultimately try and get a win under my belt as soon as I can. My game is heading in the right direction so hopefully it won’t be too far away. 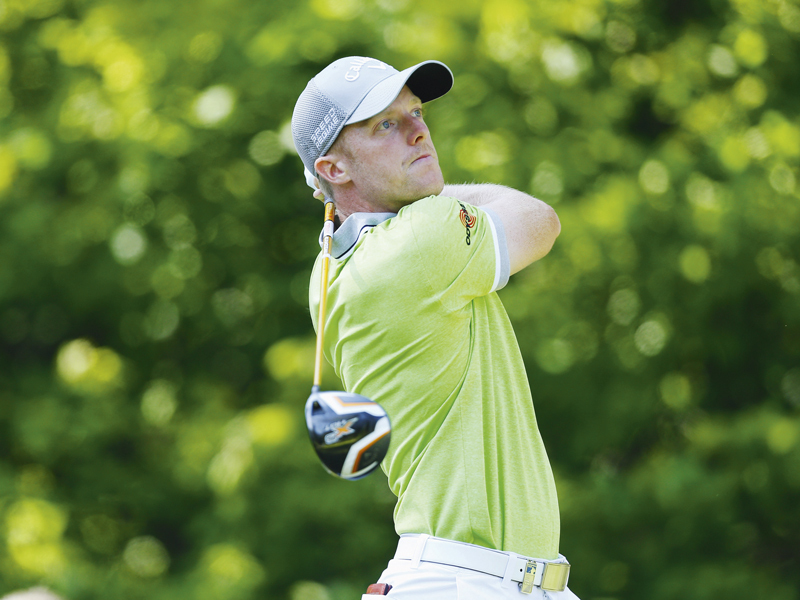 On your first season on the Challenge Tour you graduated as Order of Merit winner. Did your rapid rise take you by surprise? I always felt like I could compete. It actually turned out to be the best thing for me. The Challenge Tour is so competitive and the scoring is always so good – the courses aren’t quite as tough as the main Tour. I came out of playing in the Walker Cup which was a massive high and my confidence was high. Then I won Tour School the first week after I turned pro but I didn’t get through the second stage. So to get a Challenge Tour card based on a few invites towards the end of that year was great. I finished third in my second event at the back end of 2007 and from there I knew that I was good enough to compete out there. It took me eight or nine events to win the following year and from there I managed to build on that confidence, win again, get to the top of the Order of Merit and stay there. Your Russian Open victory last year was your third European Tour success. Which win has given you most satisfaction to date? I’d have to say the first one [the BMW International Open in Munich]. It was 18 months in coming. It was a bit of a whirlwind when I look back on it and there aren’t many vivid memories. Obviously I remember coming down the last when I was out there, but after that it’s a bit of a blur. A great feeling but it didn’t really sink in for a while. We had a great celebration. I think the first one is always the most memorable. Horsey in action during the final round of the Russian Open in 2014. You’ve sampled three of the Majors now. What did you take from those experiences? Yeah, it’s obviously a great experience playing in the States. They look after you so well over there, the standard is fantastic, obviously, playing in the strongest fields in golf at the best courses. But The Open was special. I played my first Open at Birkdale in 2008 – that was my Challenge Tour year actually. It was a great experience, especially being so local to me. I had a lot of support and managed to play really, really nicely for the first two days. I was 16th going into the weekend but the weather got the better of me on the Saturday. Major golf is where I want to be playing – in all of them every year – and hopefully eventually winning at least one. How do you cope with the constant pressures of life on Tour? I enjoy it. There are a few downsides – the travelling and living out of a suitcase all the time. Sometimes you just want to relax and have a week at home chilling out. But at the end of the day you’ve got to have a bit of a reality check. I’m playing a sport that I love for a living and there are not many people who can say that. I still love playing the game. There are a few downsides but when you have a little chat with yourself you realise they’re not as bad as you think! Do you find time to relax on Tour or are you constantly trying to improve your game? I chill out a lot more than I used to. I still practise and I’m productive when I do. But you need to unwind and recharge the batteries. Especially when you’re competing and in contention in a week it does take more out of you than you realise. I still practise pretty hard when I’m at home but I do find time for seeing friends, going out for dinner and the cinema. I’m a big Man United fan so I go to Old Trafford whenever I can. What do you feel about United at present? I think everyone thought things had turned around and the players were getting on board with Van Gaal’s philosophy. But a couple of defeats and everyone was on his back again. It’s difficult to judge without knowing what’s going on behind the scenes but I’d have taken fourth at the start of the season. It’s his first season so it’s difficult to be too critical. Have you got any favourite events or courses on the European Tour? The ones I’ve won on! I’ve got a great record on the Golf du Palais Royal in Morocco. Munich is another one. The obvious ones are the wins. Paris National – I love that place but never seem to be able to put a score together. I love the golf course though, and I love the challenge it presents. Enjoyed a successful amateur career, but exceeded his own expectations in his first full season on the Challenge Tour in 2008 by claiming two titles and graduating to The European Tour as the Order of Merit winner. Comfortably retained his card in his rookie season on the European Tour, missing only six cuts out of 26 tournaments to finish 76th in the Race to Dubai. Recorded his maiden European Tour victory at the 2010 BMW International Open in Germany, finishing 18-under-par for a one-shot victory. Three more top-ten finishes, including second at the Italian Open, helped him to 32nd in the Race to Dubai. His second European Tour win came at the Trophee Hassan II in Morocco in 2011. He enjoyed three more top tens that year and was part of the successful GB&I team which retained the Vivendi Seve Trophy. He had to wait until 2014 for his next triumph, winning the Russian Open. He made a birdie and an eagle in the last four holes to draw level with Irishman Damien McGrane before winning on the first extra hole.